I was reading this posted question on Louise Phinney's Blog, about removing the "Digital" that we associate with things like Digital Citizenship, and Digital Footprints. I commented on her blog about this idea, and I thought I'd continue that idea here. Remove the Cyber from Cyberbullying. Why? Because kids disconnect that what they are doing is Bullying. 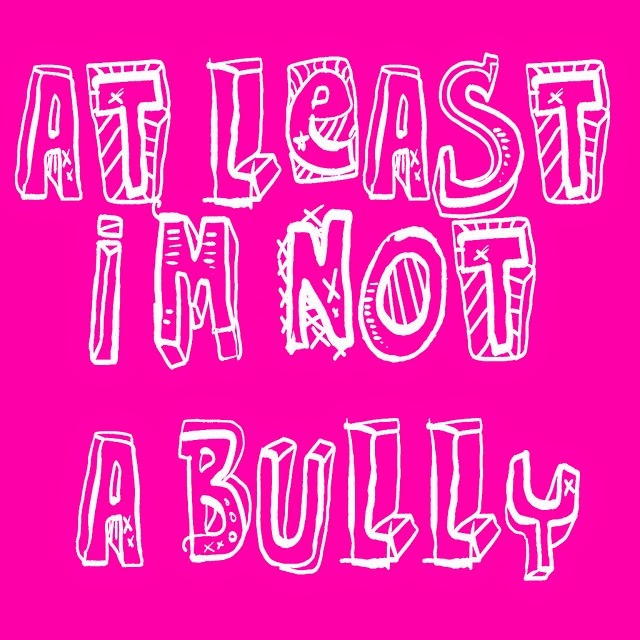 I think that Bullying is Bullying, no matter where it is done. The problem is that most kids understand what Traditional Bullying is, and think it is wrong. There is a disconnect from actions online being bullying. Kids think that they are having a joke, but the receiver doesn't think it is funny. Raychelle Cassada Lohmann discusses the proportions of kids that do Cyberbullying vs Traditional Bullying in her article. "Cyberbullying is a big problem, even more common than traditional bullying. About 25 to 30 percent of the young people surveyed admitted experiencing or taking part in cyberbullying, but only 12 percent said the same about traditional bullying. To top it off, 95 percent of the youth said that what happened online was meant to be a joke and about 5 percent was actually meant to harm someone." That 95% troubles me. They do not understand that a joke can be taken another way, in a bad way. It also troubles me that a joke gets spread online, other users repeat it, or jump in on the joke. The rumor or joke spreads quickly, making the comments worse. Online, bullying gets messy in a hurry. So here are my tips about combating Bullying online. Tips for Better posting. Send better messages. It starts with the message sender. What you post matters. Who you post it to matters. How you post it, again, matters. My parents always told me that Good Manners are for everywhere, use them online too. If you can't type it politely, than maybe it shouldn't be posted. Please, Thank you, Your Welcome... should be used as much as possible. When they are used, it is more difficult to communicate a nasty message. 4. Another movement, the Sarcasm Font, is for showing some of your other meanings. 5. Jokes should be funny to both people. If it is meant to be a joke, share it in a Peer to Peer message, rather than on a group message board. That way, if it isn't taken well, it isn't spread far. 6.Don't post anything online that you wouldn't mind your parents seeing. 7.Most importantly, treat others as you want to be treated. Think before you click. Look at what your posting or uploading and ask "Would I want someone saying or putting that about me online?" If the answer is "No" then don't do it. Tips for the Reciever. I didn't like that message. Not every bad message is Bullying, but know what to do if you are being bullied. Choose your friends wisely. "Unfriend" and block users. You do not have to be friends with everyone. Re-read the message for understanding. Are they just having a joke? Maybe let them know that you did not appreciate the comment. Save all evidence if you're being bullied. Don't delete without keeping a copy for yourself. Screen Shots are great for this. Don't respond to rude messages. If someone angers you, wait, don't fire off a rude comeback. It'll only make things worse. Tell a trusted adult about the messages. Contact host/site providers if inappropriate material is being posted on their site. I saw someone being bullied online. What should I do? Don't take a backseat, and let things happen in front of you. Take a screenshot. Gather some evidence. Don't join in, but if you know someone who's being a cyberbully tell her/him to knock it off, if they don't report it. Some of the above tips have been adapted from Raychelle Cassada Lohmann's article.